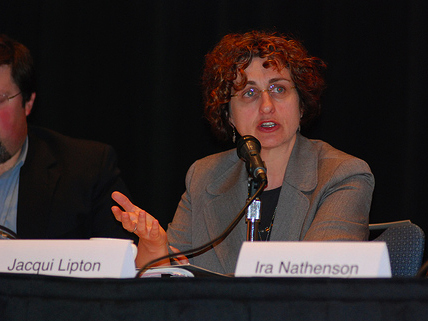 Jacqui Lipton discusses a point during the session on the Future of Intellectual Property and the Web. As introduced by moderator Dave Levine, a professor at Elon Law and Stanford CIS, and the host of the radio show Hearsay Culture (which deals with issues similar those touched upon in the panel), the goal of this panel was to analyze how intellectual properties exist within the realm of cyberspace. “As we all know, the challenge…in the IP space as it relates to the Internet is whether current law applies to the Internet,” he said, setting the stage for the discussion. Lipton spoke about Internet domain names and trademarks, and she has a book on the same topic coming out in the next few weeks. The idea for the book arose from a series of articles written on the topic over the past few years. It struck her that trademark law did not fit well into the conflicts of domain names and cyber-squatting. Eventually, cyber-squatting was put to an end and ICANN settled some of the domain name disputes. But since then, conflicts have been arising along the matter of copyrights in different countries coming against one another in the interest of having the same domain name, the utilization of names that are also copyrighted, religious phrases, etc. President Barack Obama, in fact, ran into these issues as obama.com had already been taken by a city in Japan with the same name. UDRP and ACPA settle some disputes, but the fundamental question as to whether domain names exist within copyright law and are intellectual property still exists. “Is the domain name system so different that we need to think of new ways to regulate it and new rules?” she asked. Domain names are similar to real property in that there can only be a single person registered for a given domain name, as they are singularly existing entities. There is the argument that, given the power of search engines, domain names are no longer important. But still, there is a continuously exponential rise in the number of disputes brought before UDRP. Currently, the notion of trademark dominates the ideology toward domain space, but there is still the question as to if there should be an exceptionalist route taken toward domain names. Bartow described a real-world counterfeiting case taking place in a California swap meet that, in a roundabout way, had implications for the extension of counterfeit law to cyberspace. There were organizations selling bootlegged copies of preexisting albums and videos, and the police determined that the swap meet would be the choke point to put an end to the counterfeit trade. But, the big problem is that at the meets it’s inherently difficult to check and see what material is indeed illegitimate. It is costly and an expense that no one particularly wants to take on. Online, it’s exactly the same thing. eBay, in and of itself, is a glorified auction house upon which illegitimate goods can be placed without anyone checking their fidelity. As such, Tiffany v. eBay arose, with the plaintiff asserting that eBay was advertising its goods, some of which were counterfeit, offered at artificially low prices. eBay responded by saying that if alerted, it would take action and in many cases, did policing of its own. Then, eBay determined that there is a portion of goods that are legitimate being traded, and a given amount that are counterfeit, but in the end, there was a large contingent of goods that neither eBay nor Tiffany could determine the legitimacy of, leaving both firms in an ambiguous position of what to do with indistinguishable goods. The question of what to do with the sale of damaged goods arriving from factories and arising on eBay arose as well, but most importantly, the core of eBay’s business, the sale of used goods, popped up. Tiffany wished to scare eBay into taking all of its products, used, new and damaged off of its site and thereby forcing all possible customers to resort to obtaining new Tiffany products. The choke point, in the real world and online, hit the auction houses and hosts, the idea of contributory infringement of copyright law. But the courts ruled that eBay was not liable for the sale of the goods, and its in the opinion of Bartow that courts should remain to do the same. Nathenson said that for creators of popular user-created content, the extent of their domain over content is, in many cases, made overly broad by courts and society. Copyright in the US exists immediately after the content is made, and if the paperwork is filed quickly enough, the potential damages per work go up to $150,000 for each instance of the content, even if it’s something as small as a single song. Million-dollar charges against music downloads are common. Cease and desist letters allow copyright lawyers to bully common citizens into backing down from fair use that they may actually have in particular instances, and in doing so, lawyers are extending the effectiveness of their clients’ copyright claims. The notice and take-down statue from the DMCA is called “the safety dance” by Nathenson, since it’s an intricate series of choreography in which Internet intermediaries, through the efforts of lawyers, can be removed from liability for copyright violations if they just remove the content from their sites. The individuals who are posting the information are never contacted, as the power lies in the hands of those hosting it. This also, in turn, can effectively extend the duration of copyright holdings and limit fair use rights that may exist for the individuals who are being left in the lurch, the third-party in a two-person dance, as it were. Taking content down immediately, as opposed to looking over the legal implications, is made an incentive. Stephanie Lenz, whose young son was recorded dancing to a short clip of Prince’s song “Let’s Go Crazy,” was hit with a lawsuit by Universal and Prince, but then, in a case that’s still being decided, filed a counter-suit debating that for all practical purposes, the short YouTube clip bears no negative weight against the original intellectual property. The language as to the law that exists, particularly in regard to take-down notices, is incredibly unclear and serves as an impediment to individual users to assert their rights of put-back. “Downfall” is a German film which portrays Adolf Hitler during his descent into madness, which has become a common meme across the Internet. People cut new audio tracks for the film displaying Hitler becoming furious in reaction to various different pop culture icons such as Kanye West, “Avatar” and the iPad. It did not escape the take-down law. The “Hitler meme” videos have become increasingly scarce as YouTube begins to take them down, as they’re able to track and log the videos, and even block the posting of the videos completely through their coding, serving as a chilling effect for future uses of the meme, even though some of the videos have been hosted for up to two years. YouTube’s policy allows copyright owners to opt out of fair use as there’s no requirement for content to be viewed on an individual basis and judged as such. Instead, any similarities between the copyrighted material and the material hosted on YouTube can be identified independently, and swift retribution often follows after this identification. The copyright laws don’t just adhere to the materials being hosted and how they’re constructed, but to the way in which the laws are carried out as well. Fink most recently has worked to see how legal systems pertain to virtual worlds such as Second Life. Second Life has inherent tools in place for any user to be able to create original content, though much of this content may be built using copyrighted material. Fink’s own house in Second Life utilizes a wallpaper that is a copyrighted, his virtual tractor has a Ford logo attached to it, and the question is just how such applications of user-created and preexisting copyrighted content play out. Counterfeit goods can be found even on Second Life, with Nike sneakers, for example, being sold for actual money, in virtual form, without any ties to the firm in question. Fink said that for some time during the VR world’s infancy such violations were ignored, but firms have increasingly jumped onto Second Life (and subsequently jumped off for a lack of profits) and tried to sell their own materials which do adhere to their real-world copyrights. In these virtual worlds though, there’s a feeling that such legal questions don’t even come to the mind of the common user, who sees a clear distinction between real-world goods and virtual materials constructed by individuals. A large amount of goods produced are made to be free, and the underlying code for items that are both sold for real-world dollars and for free eventually was released through less-than-noble means, leading to the counterfeiting of mostly counterfeited goods. This, in turn, led to an avatar-led strike to try and create more demand within the community for paid content, joining together in a guild that didn’t try to seek solutions through legal means. The point was to try to bring together all of their resources to bring about better promotion and encourage LindenLabs, the firm owning Second Life, to police the virtual world in the same way that Tiffany wanted eBay to police its own domain. The terms of service do, after all, say that Second Life users retain the rights to all content that they create on their own, despite it being hosted on their own servers, something which isn’t particularly common in virtual worlds. But, in turn, LindenLabs said it wasn’t their role to police violations of these rights, at least initially. As public opinion within Second Life turned against this stance though, a degree of policing did occur in an attempt to stop the copying of code. It was extended to third-party browsers used to access Second Life services. “Most people who have their formal legal rights infringed upon do nothing about it,” Fink said. Most likely, the response of individuals who have their rights violated is to utilize non-legal social methods to bring about their own degree of justice, seeking to create a culture which has norms that do not tolerate the action which violated the rights of the individual in the first place. The second WWW keynote session began at 11 a.m. with Sir Tim Berners-Lee, inventor of the World Wide Web, sitting down to a keynote plenary panel discussion on issues surrounding open government and the World Wide Web today. WWW 2010 - Panel. Left to right, on stage: Tim Berners-Lee, Andrew McLaughlin, Nigel Shadbolt, David Ferriero and Paul Jones. Mediated by James Hendler. Introduction by Michael Rappa followed by N.C. Lt. Governor Walter Dalton. April 28, 2010. Photo by Elon University Relations photographer Kim Walker. Creative Commons rights. The panel was moderated by James Hendler, a pioneer of the semantic Web from RPI. Panelists included Andrew McLaughlin, deputy CTO for the US Executive Office of the President; Nigel Shadbolt, director of the Web Science Trust and Web Foundation; Paul Jones, UNC professor and director of ibiblio.org; and David Ferriero, archivist of the United States. Each panelist had an opportunity to answer a question, before opening it up to discussion to the audience. Berners-Lee first addressed the overlying question of why society should push for access to government data on the Web. He says that open government on the Web also implies greater transparency, allowing the way the country operates to become very apparent and enables people to hold the government accountable. Berners-Lee says this can lead to stronger checks and balances and opens the government to the constructive criticism of the people. McLaughlin says one way society can encourage agencies to assume more transparent practices is by showing how open data sources can actually improve business practices. Jones spoke about some local initiatives, including the North Carolina Sunshine Foundation. The organization has developed a reputation as a strong advocate for open access to government information. Citizen participation is crucial to the continued push for open government on the Web, he said. “We’re trying to pull off a revolution as to how governments relate to data…there’s going to be some turbulence,” McLaughlin said. WWW 2010 - Vint Cerf keynote address, April 28, 2010. Photo by Elon University Relations photographer Kim Walker. Creative Commons rights. 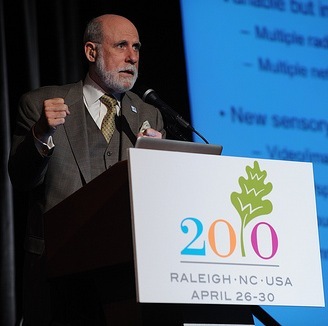 Vint Cerf gave the keynote speech to officially open the WWW2010 International Conference in Raleigh April 28. “I’m a little daunted to come and speak at this conference,” Cerf said. Cerf described his work at Google as working in the “underlying plumbing” of the Internet and not as much the visible work most consumers see. In his speech, Cerf spoke on new features of the Internet as well as the dangers most recently threatening it. Currently the Internet serves 1.8 billion users, approximately 26 percent of the world’s population Cerf said. Two of the newest aspects of the Internet that are important are cloud computing and social networking, he said. Mobile phones are also allowing for this technology to be made portable. Cerf also said technology such as Patty Mae’s sixth sense technology, which detects human gestures, may be seen more frequently in the future. “We clearly need to do some serious work to articulate and discover the information that’s out there,” Cerf said. Cerf also highlighted some of the threats the Internet is currently experiencing. Security issues are another threat, Cerf said. Some other threats Cerf mentioned included naïve browsers, weak operating systems, hackers and privacy invasions. “We all become reporters and we’ve created an environment where we can share that information with anyone if we want to,” he said. New technology the Internet is utilizing, Cerf said, includes flow routers (as researched by Stanford professor Nick McKeown), massive data correlation and sensory networks. The Raleigh Convention Center will be the hub of technology buzz at the end of April as the FutureWeb conference, co-located with the international WWW2010 conference, hosts top Internet experts and entrepreneurs. 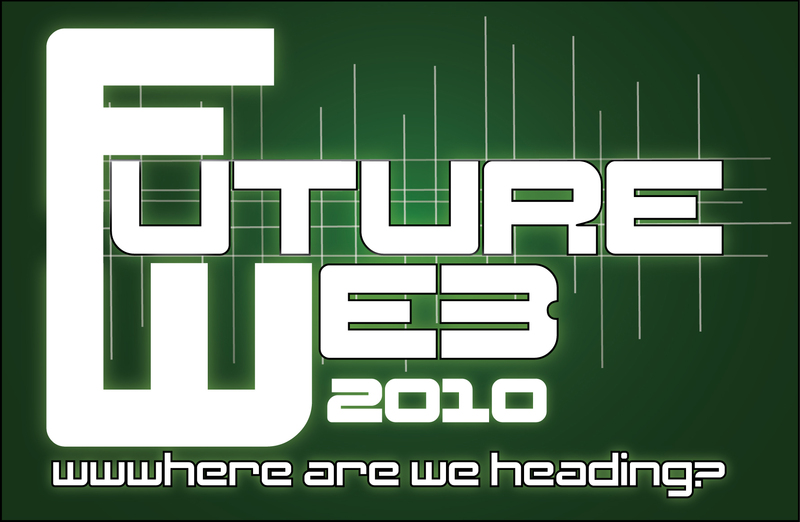 FutureWeb, April 28-30, is being led by Elon University’s Imagining the Internet Center. FutureWeb is bringing “smart people together to discuss future possibilities in order to be able to work toward the best future possible,” according to conference organizer Janna Anderson, director of Imagining the Internet. The event will host Internet experts including Vint Cerf, danah boyd, Marc Rotenberg, Lee Rainie, Doc Searls, Chris DiBona, Michael Tiemann and Bob Young, among others who will lead discussions on the future of privacy, core values, web analytics and the media, to name a few. Attendees will do more than just see these keynoters, however. They will interact with them. Anderson is expecting that participants in the conference will actively think ahead about the future of the Web even before the conference begins, arriving ready to participate in focused and valuable discussions of the trends that are likely to effect the social, political and economic future. “It is going to be a highly participatory conference, that’s what collective intelligence is all about,” she said. “We are going to have a lot of smart people in the room, not just the people in the front of the room, but also involving the audience as much as possible; I don’t even want to call them ‘the audience,’ because everyone there will be equal as far as what they have to share and give,” she said. The conference is targeted at business leaders, technology experts, marketers and students alike, and the conference’s low cost, with access for many set at less than $100, makes it a valuable event whether participants come for all three days or just one, Anderson added. Play the videos to hear what Janna Anderson has to say about FutureWeb and why the Raleigh Convention Center was selected for the event.